Even as I was writing my new book, The Journey is Everything, (it came out today!) 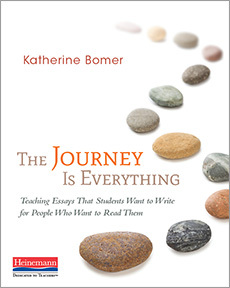 about how to write and teach essay, I did not imagine that the book’s ideas, practices, strategies, and especially, the possibilities for structuring essay would feel “transformational” for so many teachers I’ve worked with this past year. A magnificent 4th grade teacher in Missouri described essay as transformational after spending one week last summer in a writing institute I led, where teachers read essays that made them laugh, and cry, and see the world in new ways. Then they talked about, wrote, and shared their own essay drafts with each other. This 4th grade teacher’s writing to think and discover that week marked a turning point in her life, she said, and she volunteered to read her essay in front of about one hundred colleagues. She said she found her mission in life because of what she discovered in writing that essay, and from reading it out loud. She wanted to bring that power and revelatory experience to her students. So she opened her Writing Workshop last August with a passionate invitation and clear, practical strategies for writing to think in notebooks. She shared her experience from the summer and parts of her notebook and essay drafts, and then invited her students to compose essays with organic structures as their first unit of study. She says that study transformed her teaching and her relationships with her students for the rest of the school year, and now, every time I share her story with new groups of teachers I meet, it seems to plant the seed for more and more transformative experiences. It shocks me, frankly, that studying and practicing essay with teachers and their students feels transformative. When I ask why it seems so, they tell me that essaying, taking a journey of thinking, is just so radically different from what they thought essay looks and sounds like. They use words like “liberating,” “calming,” and “easy!” to describe this new (actually quite old) way of writing. One 4th grader said it felt like he was “on the radio, talking on air” because it seemed so easy to write what he thinks and not worry about fitting it into a formula. I suspect that he could hear how much his own voice was coming through in his words on the page. Perhaps what excites teachers and kids is writing about things. Yes, things. (Not to mention places, objects, books, people, and abstract concepts like jealousy or contentment). And having ideas about those things. It sets minds on fire. Though essay often uses narrative, frequently personal, to add texture and circle around an idea, it is unlike memoir. (Don’t get me wrong–I’m an enormous fan of memoir and wrote a book about it!). Essay does not need to dwell in the author’s past or try to find meaning in memory as much as a memoir would. Essay does not even need to feel personal or to be only about “feelings” because we discover we can write about super novas, walking rain (see photo above), low-riders, diseases, Darkling Beetles (from the Pinacate family) in the desert, micro-mini pigs as pets. There is subject matter as vast as the universe to explore. We can muse on the universe and have ideas about those things. We can change our minds mid-stream, mid-essay! We can borrow other people’s words and ideas to keep company with ours. We can play with how our voice sounds in writing—skeptical, smart, or smart-alecky, funny, awestruck. We can wow our readers with lyrical language and surprising structures. We can shock them with the truth. And we can do all those things in as many paragraphs as it takes. As I begin my own journey into blogging about writing, reading, and teaching, I invite you to share your thoughts, questions, and transformations as you practice writing and teaching. My dream is to have a space to pour the stories, student writing samples, mini-lesson ideas, videos of lessons and conferences, and resources I could not fit into my book about essay. And I hope to share this blog space with teachers I work with from around the world, who have crafted their own brilliant ideas and activities for teaching essay. I’m so thrilled to find your blog! This essaying work is so important and I agree. Transformative. We need a way to capture and cultivate those musings that exist in all of us. Thank you, Julieanne! I am thrilled that you found me! I hope to have many more posts about essay, and if you ever want to share one of your essays, or some work your students do with writing to think or essay work, please send my way so I can post!